Lot Detail - Union Soldier Writes From Hospital About Lincoln Re-Election, McClellan, And "Uncle Sam's Niggers"
Union Soldier Writes From Hospital About Lincoln Re-Election, McClellan, And "Uncle Sam's Niggers"
Excellent content letter, 4pp, October 12, 1864 Lowell Hospital, Portsmouth Grover, Rhode Island, ink a bit light, else fine. 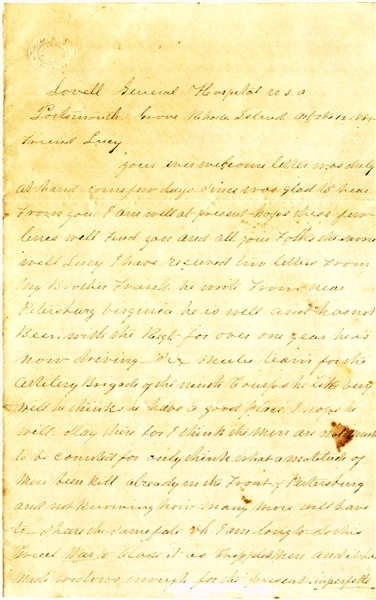 An excellent content letter written by "Andrew" to his friend "Lucy" while he is in the hospital in Rhode Island, in part: "....received two letters from my brother Frank. He wrote from near Petersburg, Virginia....he is now driving six mules train for artillery brigade for the ninth Corps....I hope he will stay there for I think the men are not much to be counted only think what a multitude of men killed already in the front of Petersburg....Oh I am long for this Civil War to close it is crippled men and made widows....The later victories of Sherman Sheridan Grant and Farragut have had a great influence on the political situation but not more than the activity of a portion of the democrats especially those in the west and together they have determined the results in November and nothing in the future can have more moral certainty the the reelection of Mr. Lincoln. It is possible that something may transpire to prevent it but not at all probable and I am in hope he will be reelected and the prospect of a speedy ending of the War is in his favor and we will admit the justice of his claim to be President of all the United States and all know that the man who plunged this country into a Civil War because of his election in 1860 should be forced to subscribe to the authority which they requested without cause....Most people now believe that the war cannot be brought to a close by him if he cannot bring this to a reunion. Little Mac will fail also for he has failed to accomplish anything. I do not believe that McClellan as a man is thought less of as his chances of election decrease but there is a great dislike to those democrats of the West who seek to incite Civil War and if they may not be able to carry the elections for this reason there are thousands of people who say let us make the majority so great that we shall hear no more of that talks after the sixth of November....And if I stand for Lincoln today I think I am for the right cause....". He signs the letter "Andrew". He did not immediately mail the letter, and continued on the last page...."I did not get my pay till the first of January 1865 well I suppose I shall have to take it now what a day would you give it to some poor old niggers here....we got quite large recruits for this hospital, we got about 700 men come yesterday mostly niggers, they smell very strong and they are the most homiest peeps I seen in my life. Some of them are Blacker than nineteen o'clock might they put me in mind of those monkeys....We told they they were Uncle Sam's niggers....". An excellent content letter.